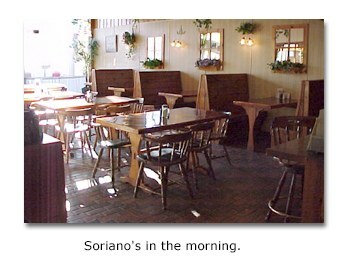 Soriano's Coffee Shop is a restaurant in Ocean City, MD that serves a delicious assortment of foods made fresh by Wayne Soriano himself. Family owned and operated since 1982, it serves Breakfast and Lunch all day. It is known for it's great coffee and is conveniently located off the boardwalk. Summer Hours - 7 days a week. 7am - 3pm. Off Season (Oct - Apr) - 8am - 2pm. This is our Coffee Shop! We are very proud to offer a relaxed environment and great food that the whole family will enjoy. Please come in and browse our menu. We are located right off the boardwalk on Baltimore Avenue in Ocean City, Maryland. Click here for directions.